Robert Hammer was born and raised in a small suburb called University Heights, near Cleveland, Ohio. His passion was always music, especially rock, British-influenced. So he began working for a local entertainment magazine called The Scene, writing columns about what was happening in the rock 'n roll world; who was in the studio making new albums; who joined or left their band. "I was considered a "walking rock & roll encyclopedia'," Hammer said. "My writing pseudonym was 'The Master' and I did some DJ work under that name as well." At the age of 24, he was asked to run an entertainment facility called "The Piccadilly Inn". The ground floor was a disco, the penthouse was a rock club, and in between were seven floors of hotel rooms. A few weeks shy of his 28th birthday, he helped open a premier, "Studio 54-inspired” nightclub called "Nite Moves", serving as designer, partner and general manager. " It opened to rave reviews, was three floors, which held over one thousand people- it was huge success!" Hammer said. Some investors from Toledo, Ohio found out that Robert was the brains behind the flourishing business, and asked him to design and build them a nightclub which he dubbed "Nirvana", It was at this time that Robert began his love affair with automobiles when he used his signing bonus to buy a 1975 Ferrari 308GT4. In 1980, after finishing his contract, he followed his family to San Diego where they had previously relocated. He spent several years trying out different careers, eventually relocating to the Bay Area, but none of them were a fit. In July 1987, he answered an ad in the paper for an automobile broker. "I went to work there and the rest is history." He learned the industry, inside and out, and used that knowledge to start his company Hammer Auto in 1993. Slowly but surely, he built the business into one of the largest most successful auto brokerage firms in the United States. In February 2004, Robert was looking for a way to give back to the community. "I asked around to find out who had their finger on 'the pulse' of my area's charitable organizations," said Hammer. The name of Gunilla Cook was given to him. Gunilla was a long time supporter of The Greater Bay Area Chapter through her relationship with her finance, board president Tom Follett. At the time, she was chairing on a committee for the All-Star fundraising event for The ALS Association to honor John Madden. " I contacted her to find out what I could do to help," Hammer shared. "She asked me if I could donate a Mercedes to The ALS Association, "Hammer said.” I laughed, but ended up donating a one-year lease on a VW beetle." Participating in that event was the first time Robert had ever met people living with ALS, as well as members of the Chapter's Board and event committee. A couple of weeks later, he was asked to be on the Board. "I was extremely honored and moved by the opportunity." Hammer said. Over the following years, Robert Hammer chaired or co-chaired The Chapter's annual All-Star Gala events, often emceeing the events as well. He has also donated leases on premier vehicles to be auctioned for various fundraising events. "The ALS Association and helping people with ALS has touched my heart," said Hammer. "It has inspired me to be giving of myself ever since. When there is a Walk or Ride in my area, I try to get there and assist the event however I can." One of the ways that Robert helps to support the Golden West Chapter is through helping people manage the charitable donation of their vehicles. "I sell the vehicle and give 100% of the proceeds to the Chapter," Hammer said. "If you go anywhere else, 90% of the funds end up in administrative fees and the Chapter only gets pennies on the dollar. Also, if people donate $1000 or more to the Chapter, Hammer Auto will waive a portion of the broker fee on any new vehicle." 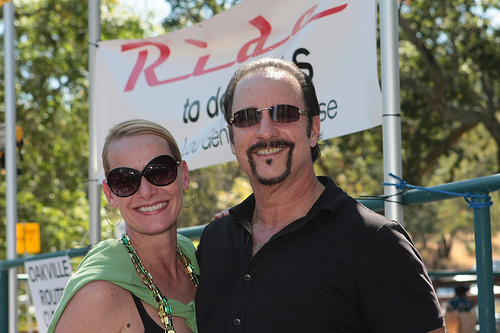 Robert's wife Tammy has deep pride in her husband's longtime involvement with the Golden West Chapter. "I will always be at Robert's side and fully committed to what we can do in the fight to defeat ALS," she said. “Another reason for my involvement with ALS is that it is such a misunderstood disease," Hammer shares. "Most people don't know that there are thousands and thousands affected in the US alone. I tell people that ALS makes people a prisoner in their own bodies. It is profoundly sad the way that disease impacts whole families." "Imagine what the millions of people in California could do to make a difference in the fight against this devastating disease if they were to "Get the 414" and support ALS research on Line 414- ALS/Lou Gehrig's Disease Research fund initiative on their California taxes." "I urge everyone out there to use social media, e-mail and speak directly to your sphere of influence about Lou Gehrig's disease. Let them know that they need to reach out exponentially to ask their friends' spheres to educate people about ALS."